Today I’m excited to bring you holiday entertaining tips with Mirassou. 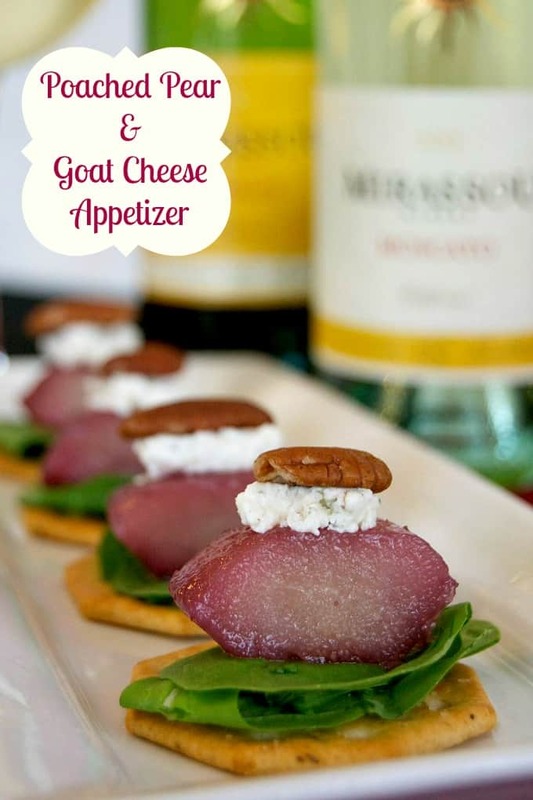 Red Wine Pear, Arugula and Goat Cheese Appetizer – a slice of Bosc pear soaked in Mirassou Merlot on top of your favorite cracker, and pieces of arugula Top it with goat cheese and a pecan half and you’ve got a great appetizer to get your party started! Have you been entertaining for the holidays? Do you still have more entertaining on your calendar or parties to attend? We certainly do during this busy time of year and one of my favorite beverages to serve is wine. 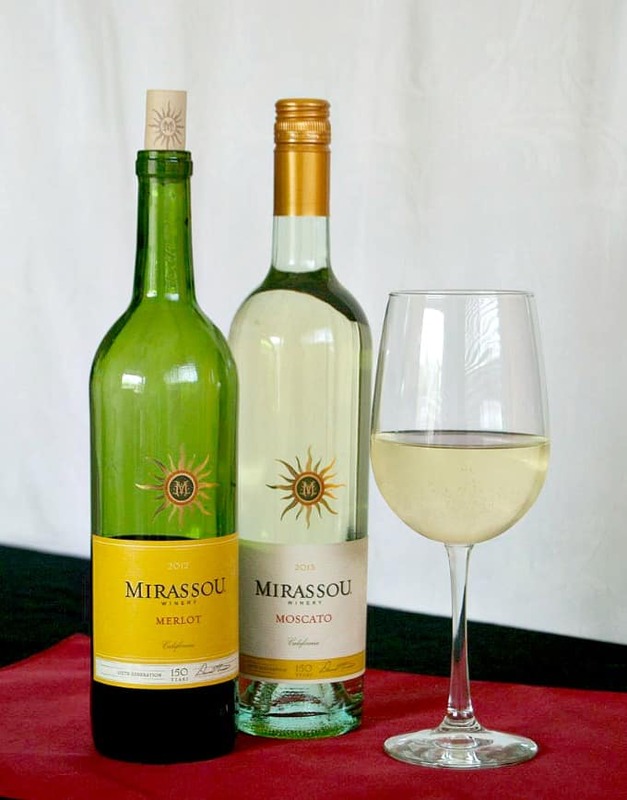 One that I’ve fallen in love with is Mirassou wines, especially their Moscato! With the holidays here, I’m going to spread my love of Mirassou with my family and friends when I host a gathering or when we attend one. These ideas top my list of ways to do that. Giving a bottle of wine as a holiday gift to your host is always a wonderful and much appreciated gesture. Mirassou makes it easy to give as a gift because it’s beautiful sun label makes it easy to locate in the stores and only costs about $12 a bottle. You won’t even have to wrap it, it’s so pretty! Find Mirassou at a storenear you by using their Store Locator! 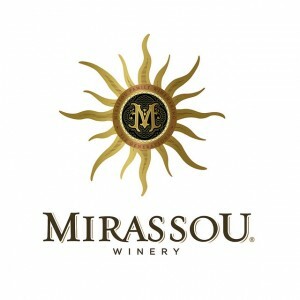 Mirassou Winery is offering a $3 off coupon to help make your holiday gatherings shine. Oh, and did you know that Mirassou is America’s oldest winemaking family and that they’ve been crafting wines in California for over 160 years?! So you know their products are well liked by many. In a saucepan over medium heat, combine the Mirassou Merlot, water, sugar, lemon juice and thyme springs. Bring to boil and cook for 5 minutes while stirring to dissolve sugar. Peel, core and quarter the pears. Add to saucepan and reduce heat. Simmer pears for a total of 20 minutes, rotating after 10 minutes in case they aren't completely submerged and basting them throughout. Remove from heat and allow to sit in wine for 20 minutes. 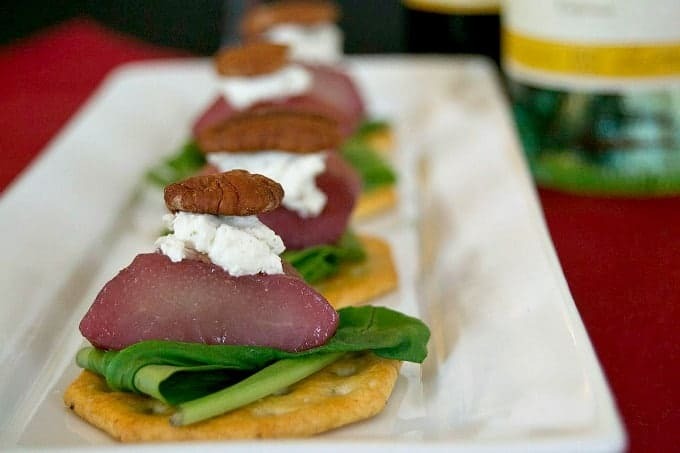 Place two pieces of arugula on each cracker. Cut the pear quarters into four equal pieces and place onto arugula. 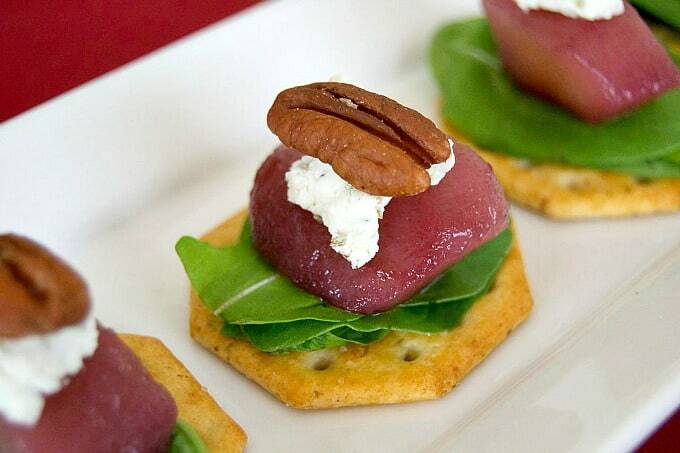 Place a piece of the goat cheese on the pear and top with a pecan half. I rate everything I make on a scale of 1 – 4 with 4 being the best and these Poached Pear and Goat Cheese Appetizers earned 4 rolling pins! It was a unanimous vote here from the 365 family, so I do believe it’s an appetizer you, family members and your guests will enjoy. It was a delicious mouthful of flavor! 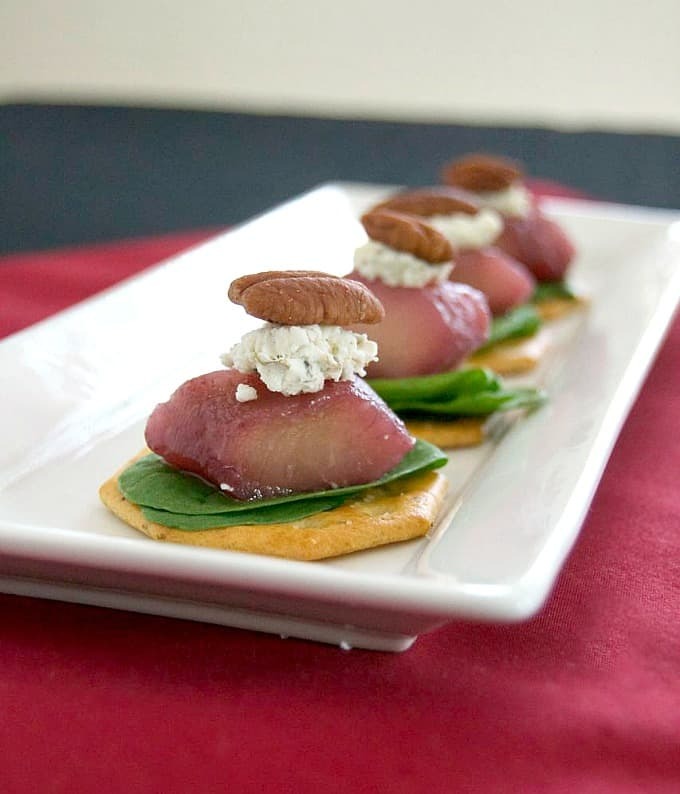 The Merlot poached pears were really enhanced with the arugula, goat cheese and pecan. The cracker I used was flavored with rosemary and that added to it nicely as well. 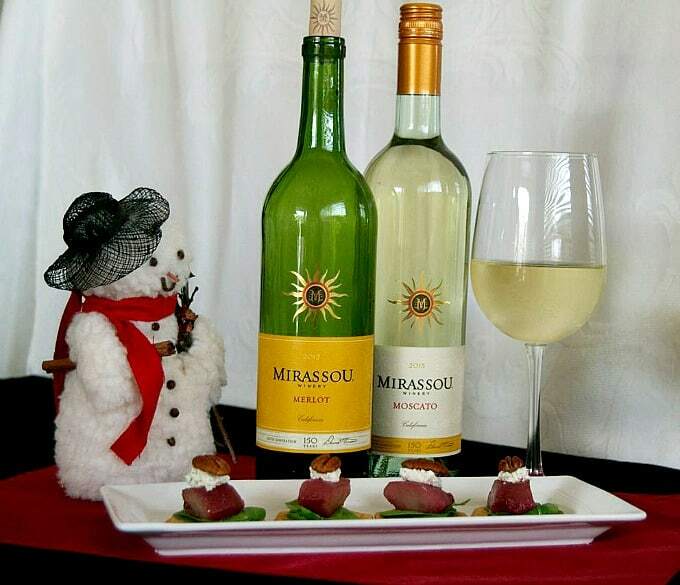 Holiday entertaining with Mirassou – it’s on my to-do list! This is a sponsored post written by me on behalf of Mirassou.